I went to a cafe recently where they tried to charge me $8 for a glass of ho-hum ginger beer. That’s, well, ridiculous. You can bottle the stuff by the litre at home for next to nothing. All you need to get started is a spoonful of yeast (even if you use Premium Ginger Beer Yeast from a home brew store, it’s only going to set you back $2.70), a 30g box of ground ginger ($2.24 from the supermarket), a 1kg bag of sugar ($2.84) and a couple of lemons. That’s only $7.78 – and that’s enough to make 5 litres (or 20 glasses). And it goes without saying that homemade ginger beer tastes at least 20 times better than the bought stuff too. 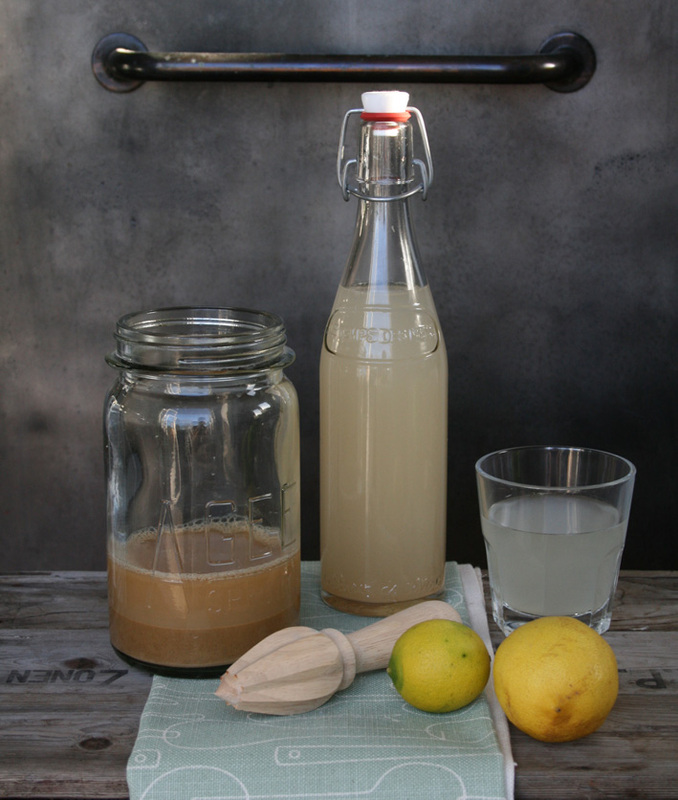 To make your own ginger beer, you need to make a ginger beer bug first. I’m not sure why it’s called a bug – Mum says she used to call it a plant – but really it’s just a jar of bubbling gingery goo. Start with 1-2 tablespoons of dried yeast (if you don’t use brewer’s yeast, use Edmonds Active Yeast – it has a yellow lid, whereas the bread yeast has a red one). Place the yeast in a glass jar with 1 teaspoon sugar, 1 teaspoon ginger and 1 cup cold water. Cover the jar with a loose piece of fabric to stop bugs getting in but still allow the yeast to breathe, then place it somewhere warm for a day to get it going. After that, feed the bug every day with 1 teaspoon sugar and 1 teaspoon ginger. Seven days later, you’re ready to bottle your first batch of fizz. In a large bowl, dissolve 2 cups sugar in 1 litre boiling water. Add the juice of 2-3 lemons and 4 litres of cold water. Then strain off the liquid off the top of the bug (set aside the sludge) and add to the water. Stir well and bottle. I’ve been recycling plastic 1 litre water bottles (just because we had a stash of them left over from the wedding), but any soft drink bottles will do the trick. Keep an eye on them; as soon as they go hard or start to push out their bottoms, you know they’re full of fizz. Mine is generally ready to drink in 3-4 days. Chill the bottles before you open them; it calms the bubbles down. The best thing about making ginger beer is that, once you’ve made the bug, all you have to do is keep feeding it. Once you’ve strained off the liquid, add a fresh cup of water to the sludge and start the whole process all over again (except you don’t need to add any yeast this time). But what really spurred me to write about ginger beer today is that on Nine to Noon on National Radio this week, I heard chef Paul Jobin share his recipe for corned beef cooked in ginger beer. It sounds seriously good and, fortuitously, not only do I have plenty of ginger beer, I’ve also got several lumps of silverside in our freezer from the crazy old bull we culled last year! To make Paul’s ginger corned beef, you need 1 corned silverside; 1 onion, peeled and sliced; 1 knob ginger, sliced; 1 orange, sliced; 1 lemon, sliced; 1 bay leaf; 4 sprigs thyme; 1 chilli, sliced; 2 bottles of ginger beer; and extra water. In a saucepan or crockpot, add all ingredients, adding water to cover the corn beef. Bring to the boil and simmer for 1½ hours (or overnight in the slow cooker) or until a skewer inserts easily. Allow to cool down in the stock. Nothing tastes better after a hard day in the garden, or even an easy one, than a cold glass of home made ginger beer. It leaves the bought stuff for dead! The advent of plastic bottles is a bonus. I remember one of my dads brews exploding in the garage while we were away on holiday and coming home to find bits of glass embedded in the roof of the garage and the bike tyres of the bikes leaned along the side where the bottles were stacked! I’ve stopped risking it with glass bottles after an unfortunate apple cider explosion in my lounge a few years ago! It’s amazing how the build up of gas can blow glass bottles to bits. Amazing and also a wee bit terrifying! To avoid the glass bottles exploding, “cap” each bottle with a rubber balloon. Does that work or are you taking the mickey? Heh. I rather like the idea of balloons slowly inflating in my pantry! It works for wine, but then you usually don’t want the fizz in wine. You just have to remember, of course, to remove the balloon and cap the bottle properly before ALL the fizz is gone. Oh, and because the balloons leak a bit, the balloons never really get big. They just let out the air slowly while keeping the liquid clean. That’s awesome. I’m going to try it! Oh I am tempted to do it again but I’m not sure what my husband would say…last time I did I managed to explode 6 glass bottles under the stairs. Some more bottles when put on the grass, exploded and travelled at great speed across the lawn. I was told all this by my husband as he had the job of cleaning up I continued on with things and went to Yoga … nice and relaxing! Ginger beer torpedos on the lawn… love it! My partner is also experimenting with homemade Ginger Beer. His first few attempts have come out very lemony, but he says the batches are getting better as the “plant ages” and he is starting to get a slight ginger “burn” in his throat. He must be doing something right though, as he got rather tispy from the last bottle! Alas, I have not had any yet, as it isn’t “perfect enough to share”. Tell him not to put so much lemon in. I generally use 2 lemons (unless they’re really small), even though the original recipe called for 4. I made rhubarb champagne this year too, which is supposed to be non-alcoholic. I found the first bottle was a bit lemony/cider vinegary… but a couple of weeks later that flavour had matured and now there’s no hint of lemon. However I suspect it’s slightly alcoholic after all – it has a definite tipsy undertone, so the last three bottles will have to sit on the shelf till the baby’s born. The Man has become ginger beer crazy. He has now got 4 plants on the go, 2 using ground ginger and 2 using fresh ginger. It appears the fresh ginger is the best by far – I was even allowed a sample glass! He is going to keep the experiment going with both plant types and will make comparisons over the next couple of months, re alcohol content and taste, burn (apparently important factor for G/beer) etc. Will keep you posted on this results. I’d like to make my own ginger beer with fresh ginger. Never have before. How much fresh ginger does he give the bug every day? Oh ! that recipe brings back memories. As a girl in the 50’s , bottleing the ‘ginger beer ‘ was a Saturday family project . We girls would pick up large beer bottles and lemonade bottles, and Mum and Dad would sterilise them after we had washed them in a drum which had one of those hand bore pumps (up and down motion!!) over it. As each bottle was filled we would take turns with the bottle capper (it closed down the old fashioned beer bottle caps.) the ginger beer was then stored in the wood box. Those had a door from the outside, as well as an internal one. and nice and airy —– The daily feeding of the ‘bug’ after it had been divided, was a ritual. Those were the days ——- Gaynor Tait. When feeding the ‘bug’ do you stir the additional ginger and sugar in or just sprinkle over the top? I just drop it in and give it a wee shake. I don’t think it matters. I think I’ll be replacing some of my ’emergency water supply’ with ginger beer. I’m just starting the bug now. I remember HATING the ginger beer my friends’ dad would make when we were kids, mostly repulsed by that freaky floating raisin, but am willing to give it a try with my grown-up palette. Day One: Start plant with 1 tsp each sugar & finely grated root ginger. Place in jar with 3/4 pint boiled and cooled water. Stir & when settled sprinkle 1 lvl tsp yeast on top. Cover with muslin and put aside in warm place. Day 2-6 add 1 tsp each Sugar & Finely grated ginger root, stir well each time. Day 7 for 5 litres ginger beer place 680g sugar & 4 heaped Tbsp finely grated ginger (we use a muslin pouch for the ginger) into a large pot. Dissolve sugar with 2.5 litres of boiling water add remaining 2.5l boiling water stirring constantly and the juice of two lemons. leave to cool to about body temp, then strain through muslin into a sterilised bucket. Strain the contents from your bug through the muslin as well and taking a jug full from the bucket, pour through muslin to rinse the starter again. Gently squeeze juice from starter. Stir well and stand until stabilised at room temp. Bottle and ferment for 7 days. Start again at day one with the addition of half the previous starter. Glad to have found this recipe, as our GB bug has recently gone south, and I am having withdrawal symptoms! My old recipe means you have to wait 3 weeks before bottling… that means a month at least without it!! So, do I use the liquid or the sludge? And what do I do with the set aside sludge? Sorry to be so thick, but I haven’t even see a bug before! You strain the liquid off and use it. Then you top up the sludge that’s left in the jar (the bug) with a fresh cup of water, a teaspoon of sugar and a teaspoon of ginger and start again. Good luck! Hi Linda – just bottled the ginger beer in bottles (got them from the Warehouse for $2 each) hoping they won’t explode!! and labelling them and giving them as Xmas pressies. Can you tell me how long you wait until you can drink the ginger beer once bottled? How did you sterilise the recycled plastic bottles?